Fujita is a new arrival in the market of massage chairs and other massaging gadgets. Even though it is new, it has made its mark already with its new and innovative features as well as the flexibility in the price as compared to other massage chair manufacturers. With the way its ratio is increasing, it is possible for this company to land in the top 10 manufacturers list pretty soon. 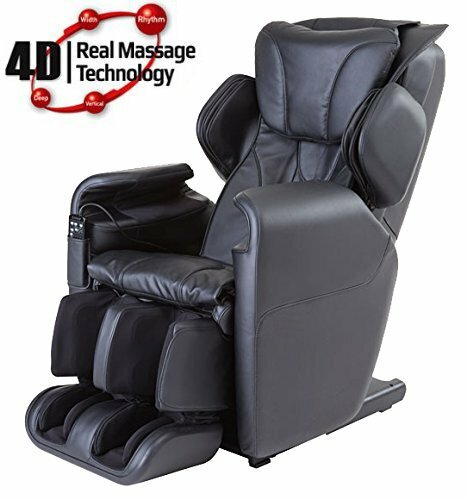 The new innovative 4D technology is very less found in any massage chair till now. But, SMK92 is exclusively a 4D technology massage chair which is made to make your massage session feel just like a human massage. The massage chair comes with a 9 auto massage courses which take you to a literal tour of the massage world as it feels different in every course of session yet the relaxation is pretty much the same. Even though the 9 auto massage courses are enough to make a person decide of his/her choice, the massage chair has 35 manual massage techniques which are a little more than any massage chair at this price range. The unique style of combining two massaging techniques is seldom found in a massage chair even at a higher expense. But, the SMK92 model has massage combination modes like knead and tap, rub and roller, etc. However, it has massaging techniques active like kneading, tapping, rubbing, shiatsu and rolling. The advanced scanning technology accurately scans almost all kinds of body structures and finds the right points of the body to massage. This makes the massage session feel almost realistic as of a masseuse. Fujita provides special features but at times lacks in the basic functions and features which are necessary for a massage chair to be opted for such as the reclining lacks in stretching. At the amount spent on this chair, one could get an extra option of zero gravity which is what people prefer on a daily basis to relieve the stress. The neck and foot massage is too sensitive and lacks energy. There is no heating provided in the chair to enhance the massage session. The rollers after every massage session go back to the initial position and for a manual massage selection, start from the initial point leading to discomfort in choice of a particular body part to be massaged. The manufacturers provide free shipping only to eligible customers and the eligibility is not yet clear to a general viewer. However, most of the countries have free curb side shipping available on this chair. The leather work is good and comfortable but not too strong. Scrubs and scratches are two very close things when cleaning the upholstery of this massage chair. The SMK92 is an updated version of the previous massage chairs combined but lacks a lot of features available in them. This makes a person choose rather the previous version being cheaper than this model. Many would say that 4D technology is not much different from the 3D technology of body scanning. But, when you use both the technologies, you will automatically opt for 4D. This chair even though lacks a few minor features, covers up the lags with its new and innovative features and is a must try for people who are interested in new ways of massaging experiences.